With Atletico Madrid’s victory against Dortmund, along came Antoine Griezmann’s stellar performance and another claim for the Ballon d’Or. 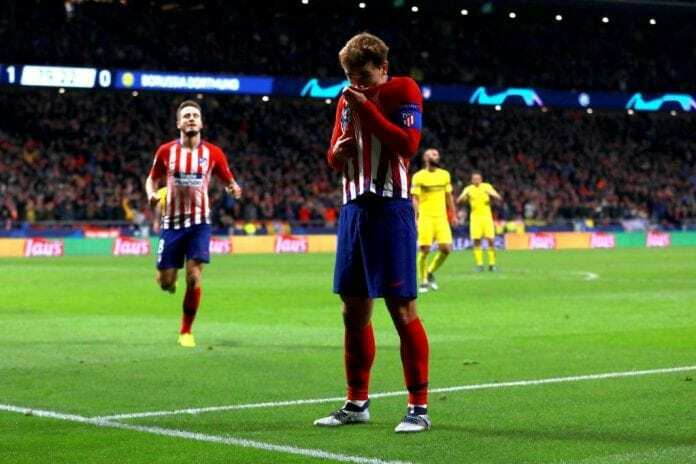 There is no doubt that the Champions League is the ideal tournament for players like Saul Ñiguez and Antoine Griezmann, both of them scored this Tuesday against Borussia Dortmund and proved that Atletico Madrid isn’t dead yet. The ultimate goal this season is the grand final at the Metropolitano, a stadium that witnessed how the Colchoneros were reborn after the appalling 4-0 defeat in Dortmund a couple of weeks ago. The whole race for the Ballon d’Or is entering the final stages of the year, as the ceremony approaches there are two players who seem fit to get the award and Luka Modric isn’t one of them. The most obvious choices right now are only Cristiano Ronaldo and Antoine Griezmann, both players kept the highest level of competition throughout most of 2018 and they both seem to be the obvious choices for all the voters who will have a chance to select the next Ballon d’Or. There are very few other players who can be considered for the award, maybe Modric will get a few votes as Kylian Mbappé also will. But the final race will be between the Frenchman and Cristiano. In a World Cup year, the reality is that a player from France is the obvious choice after last summer’s success from Les Bleus. The problem here has a name, it’s obviously Cristiano Ronaldo. The Portuguese forward has proved repeatedly that he is even above Lionel Messi during the last couple of years, he has won more trophies and been more important for his squads without question. After moving to Juventus during the summer, Ronaldo proved once again that he is the one who wins the matches as he already got the whole Serie A fanbase in his pocket through incredible performances week after week. But Griezmann isn’t too far behind with night like the one he just had against Borussia Dortmund this Tuesday. The sum of his whole year can actually be described with the whole play in which he scored his goal against the German squad. As he received the ball from Thomas Partey, the French star had a Dortmund defender on top of him and he managed to endure the complicated marking throughout the moments that took him to release a well-placed strike without ever giving up. Never surrendering to the obstacles, that’s what Griezmann’s year has been all about. ¡La joyita que nos regaló Griezmann! After the 2-0 result against Dortmund, Griezmann was questioned about the Ballon d’Or and his response proved that he finally learned to not give the subject a lot of importance. “I really don’t know anything about that, all I care is about enjoy and play football. Nights like today are the ones that give me the joy of playing for this club,” said Griezmann via Diario AS. Who do you think will win the Ballon d’Or this year, Griezmann or Ronaldo? Please share your opinion in the comment section down below. 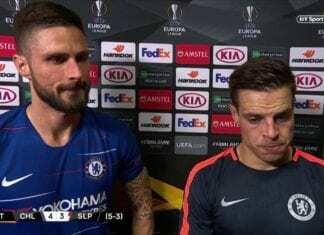 Olivier Giroud reckons that a drop in intensity was what allowed Slavia Prague to launch a comeback in Chelsea's 4-3 thriller in the Europa League.